The team explains that graphene in the form of nanoribbons show so called ballistic transport, which means that the material does not heat up when a current flow through it. 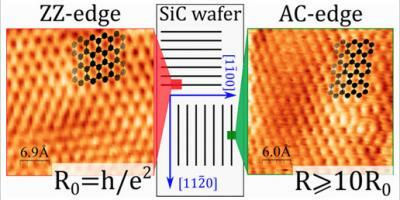 This opens up an interesting path towards high speed, low power nanoelectronics. The nanoribbon form may also let graphene behave more like a semiconductor. The properties of graphene nanoribbons are closely related to the precise structure of the edges of the ribbon. Also, the symmetry of the graphene structure lets the edges take two different configurations, so called zigzag and armchair, depending on the direction of the long respective short edge of the ribbon. The electrical characterization also shows that the resistance is many times higher in the armchair configuration of the ribbon, as opposed to the lower resistance zig-zag form obtained. This hints to a possible band gap opening in the armchair nanoribbons, making them semiconducting. The process used for preparing the template for nanoribbon growth is readily scalable. This means that it would work well for development into the large-scale production of graphene nanoribbons needed to make them a good candidate for a future material in the electronics industry. "So far, we have been looking at nanoribbons which are 30-40 nanometers wide. It's challenging to make nanoribbons that are 10 nanometers or less, but they would have very interesting electrical properties, and there´s a plan to do that. Then we will also study them at the MAXPEEM beamline", says Zakharov. The measurements performed at the MAXPEEM beamline were done with a technique not requiring X-rays. The beamline will go into its commissioning phase this spring.